Brownies. I've got nothing against them. I just have nothing for them. I appreciate them. I like them. But I don't loooooove them. Doctor them up? Perhaps wrap them around an Oreo? Now we can talk. 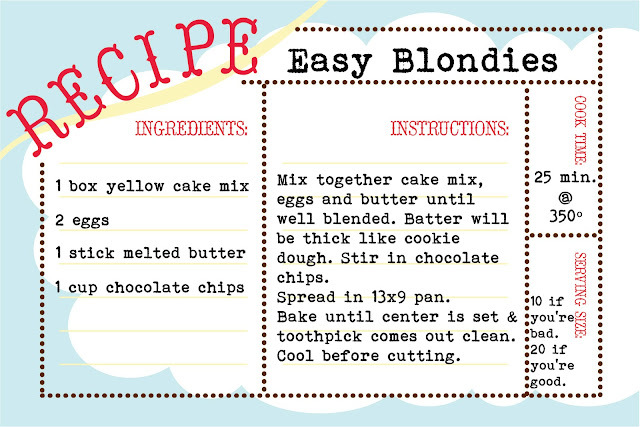 Blondies are entirely different. I'm not sure why, but they deserve my love. Fast four ingredient ones? True love forever and ever. Especially since I am fairly certain that you have all four lazing in your kitchen this very moment. Preheat your oven. It is ON! Part cookie. Part cake. All awesome. Just like the evil Two Ingredient Fudge, you are only limited by the combinations that you come up with. Or the choices in your pantry. All I had was white cake mix and semi-sweet chips. So perhaps these are a bit more platnium than blonde, but the taste was hardly different. Next in the queue are the teeny tiny Reese's Cups. Can you just imagine? Feel free to attack the pan immediately after removing it from the oven. Not like I did or anything. But my most favorite thing to pair them with? Ice cream. Messily smashed up in a big bowl of ice cream. Dreamy, soft, and oh so cookie dough-esque. Enjoy and tell me what combinations you try. Seriously, Julie...really. Ugh now I have to get these ingredients. Sigh. Yet another reason I wished you lived next door, I would so be at your house right now jacking these. Dang, I DO have all those ingredients in the house. Now I have no choice but to make them, and my serious lack of self control ensures I'll have the pan licked clean by tomorrow. Uh-oh. This new knowledge could be quite dangerous. I think have a cake mix...and chocolate chips. Looks like my sugar break-up might come to a screeching halt. ack... i'm totally gonna make them. those look super yummy! my kids would love to make those! made these before with butter pecan cake mix! SO SO good! Just a little variety! My hubby used to make these .alot. We did the devil's food cake with choc chips and also with peanut butter chips. Mostly the yellow with choc as that is his fave. well a cake mix? duh why didn't i think of that? i just made monster bars tonight. would you like those? sortof like a gooey oatmeal cookie with m/ms but in bar form. Crazy easy! Thanks for sharing! evil. evil. EVIL. eviler than ruffles. Great! Now I have to make these. And probably eat them too. My expanding waist line thanks you! If they taste anywhere near as good as the toffee crack, then I am all over them!! :) yumm . . .
oh my GOODness, i'm making these. soon. 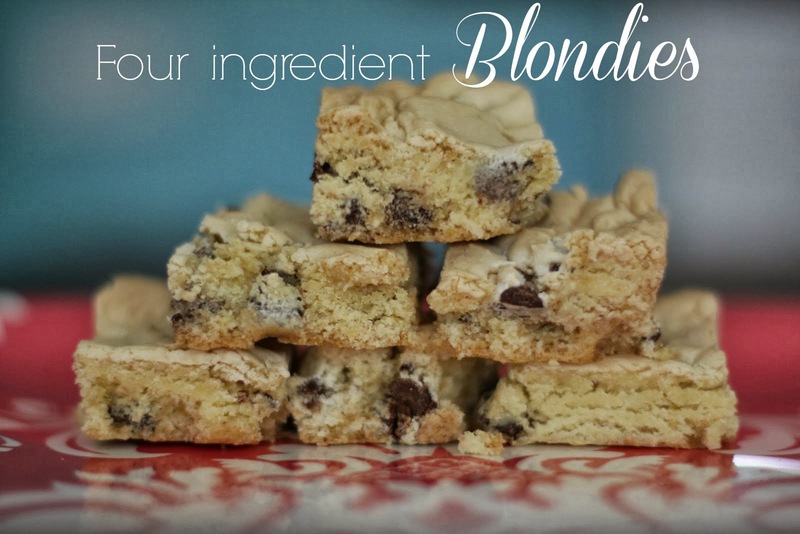 i have always loved blondies, haven't had them in forever, and your recipe looks amazing. YUM! Yummy and simple!! I need to pick up some cake mix and whip these up ASAP. I love blondies too! I made a special trip this morning to the store for cake mix to make these for our 'special snack' today. My kids will be thanking you later! Had all the ingredients to make them just as the recipe said. All I can say is Yum! The pan is almost gone! I made this today, but gluten-dairy free, becuase that is my diet! We ate the whole pan before dinner. Good thing I have enough to make more! You are the devil...I can't have these until after Easter...but I want them NOW!!!!! This recipe was awesome and oh so easy! Perfect for a snowy day in Missouri! Just made these on Friday and everyone in my house devoured them! Definitely a keeper recipe. Thanks!! made these with my kids this afternoon, yum!!!!!!!! thanks for such a great recipe...you made me look like a rockstar mom last night! oh my goodness! made these today and they were so yummy!!! i made these right before i went for my run, ate one hot out of the pan, ran 2 miles, and then back to the pan for more!! Brownies are my favorite dessert! Can't wait to try these, they look so good! 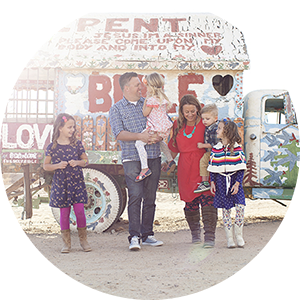 I just found your blog thru a friend and I must say its easy for me to relate with some of your postings!Im also expecting and you could say i just came out of hibernation (in my 5 month) and it has been not so blissful! However, i made these amazing little wonders and i'm so hooked! super easy and super yumo! Just found your blog and have been reading ... and reading ... and reading. Love it! It's a ray of sunshine. 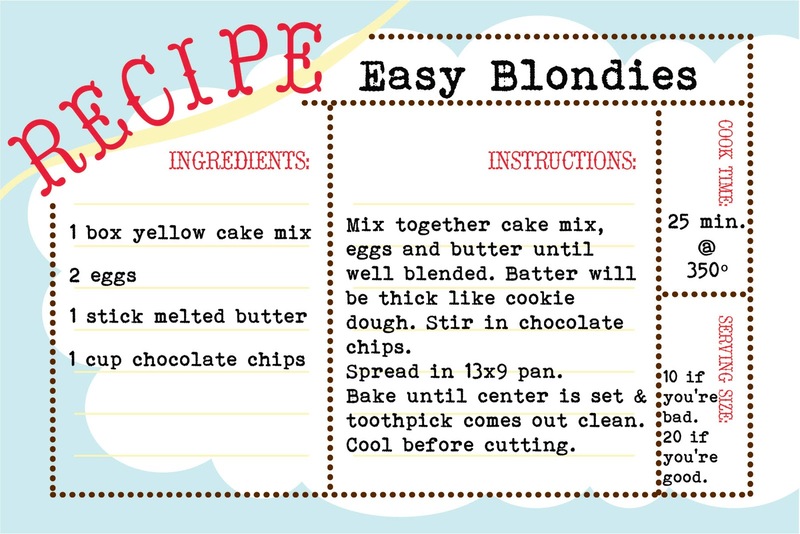 These blondies sound to good to be true. Easy and yummy? We just might have to make them tonight. Hope your weekend is BLESSED! I think I just went crazy with the "creativity" side of your directions. I made one batch with chocolate cake mix, chocolate chips, and some chopped nuts. I made the next batch with yellow cake mix and butterscotch chips. I spread the chocolate layer in the pan, then topped it with the "blonde" layer. Then, after baking, I made a chocolate sour cream frosting to top it off with. Off to cut the cake. It looks/sounds delicious.